The 30.65 metre sailing yacht Xnoi, jointly listed for sale by Bluewater with Thompson, Westwood & White, has had a price reduction of €1,400,000. Built in carbon fibre by Italian yard Perini Navi with exterior styling and interior design by Nauta Design, Xnoi was delivered in 2012 and has had the same owner since new. Light oak is used throughout her accommodation for 10 guests in four cabins comprising a master suite and three twins with Pullman berths. All cabins have entertainment centres, Sharp Aquos 17 inch television screens and en suite facilities, while a further two cabins sleep four crewmembers aboard this yacht for sale. The main saloon allows guests to experience the four public areas of the boat at the same time: the main saloon with a large table which seats eight; a sitting area which can be transformed into a second lunch area for five; a lower saloon sitting/TV area and an office area with PC, printer and fridge. On deck, her large main cockpit includes an adjustable table that can seat up to 10 guests on linen covered cushions for al fresco dining and there is also a sunbathing area. 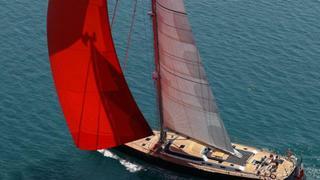 She is an extremely elegant, low weight and high performance sloop-rigged yacht, featuring a carbon fibre mast and boom and including Harken deck hardware and titanium fittings. Under power, a 305hp Cummins diesel engine delivers speeds of up to 10 knots. Xnoi is pronounced 'per noi' meaning 'for us'. Lying in Genoa, Italy, Xnoi is now asking €5,750,000.